These Hand-Pattied Hamburgers are so easy to make, and taste so much better than store-bought hamburger patties! You’ll want every night to be burger night! The weather is warming up, the sun is shining, and it’s time to get the grill ready! 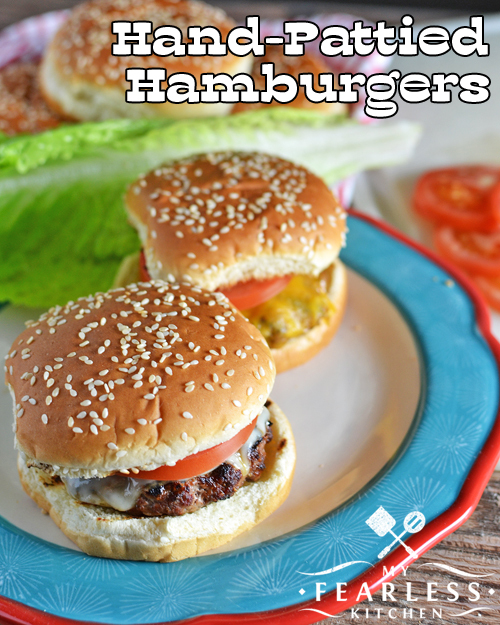 Hamburgers are a quick and easy way to throw together dinner, and when they are Hand-Pattied Hamburgers, they taste even better! Now don’t get me wrong, we always have some store-bought hamburger patties ready to go in the freezer. They are fast and easy, and you almost can’t mess them up. But when I have a little extra time (and I remember to thaw the ground beef ahead of time), I really like to make Hand-Pattied Hamburgers. Most of the time, a pound of bulk ground beef is going to cost a bit less than a pound of hamburger patties. 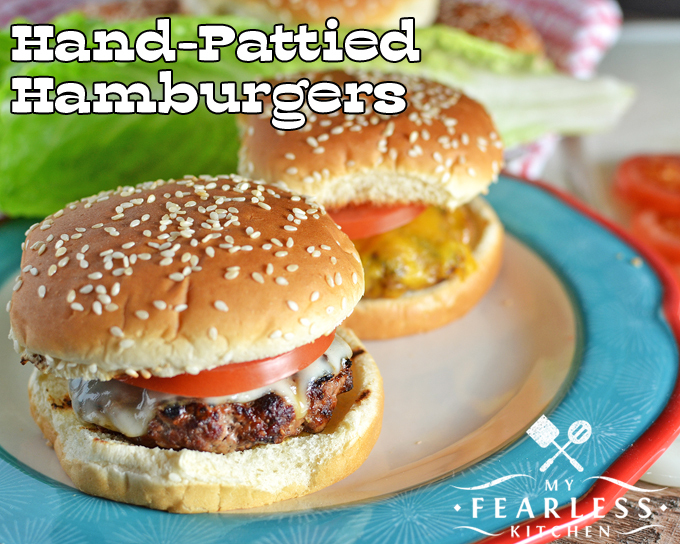 And, when you patty them yourself, you can add any flavors you want! These hamburgers are pretty basic – Worcestershire sauce (because it’s tasty and fun to say), minced onion, salt, pepper, and Italian seasonings. You can change it up or add any other seasonings you want! The most important thing when you’re grilling hamburgers is to not press the patties flat. I know, I know. We’ve all seen it done our whole lives. You take the spatula, press down on the burgers, and the grill sizzles and sputters. It’s the classic grilling sound, right? Well… do you know what that sizzle and sputter sound means? That sizzle and sputter sound means that you just squeezed a lot of the moisture out of your burger. The liquid hit the hot grill and boiled away. No more juicy burgers. So sad. So, what should you do instead? Make sure you’re using a moderately lean ground beef. 95% lean ground beef won’t have much moisture in it, so you’ll end up with a dry burger. 75% lean ground beef will have a lot of fat, and will shrivel up into tiny burgers when you’re done cooking. Instead, look for 85-90% lean ground beef for your hamburgers. Then add a little bit of moisture when you’re mixing up your patties. (That’s what the Worcestershire sauce is for. You could also use soy sauce or just plain old water.) And, please, make sure you don’t squish all that moisture out when you’re cooking the hamburgers! I love cheese on my burgers. If you want a cheeseburger, add a slice of cheese on top of the burger in the last 1-2 minutes of cooking. The cheese will melt perfectly to cover your burger. Toasted buns? My favorite! Take the burgers off the grill, turn off the heat, and toss the hamburger buns (cut side down) directly on the grill grates for a few minutes. Take them off the grill when they are at the perfect level of toastiness. Then top your burgers with your favorite stuff… These just have tomato, but we also like lettuce and lots of pickles. 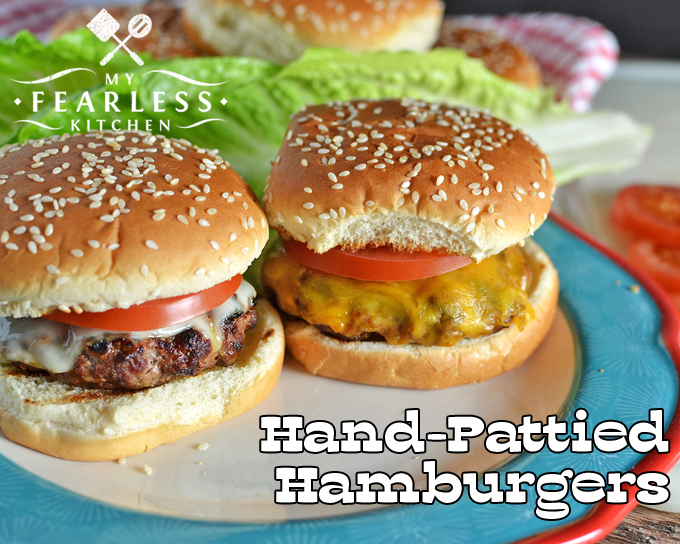 These Hand-Pattied Hamburgers are so easy to make, and taste so much better than store-bought hamburger patties! You'll want every night to be cheeseburger night! In a large bowl, combine beef, onion, Worcestershire sauce, Italian seasoning, salt, and pepper. Use your hands to thoroughly mix the spices into the beef. Separate the beef mixture into 4 roughly equal portions. Shape each portion into a ball. Then, using the palms of your hands, flatten the ball into a patty. Use your thumbs to smooth the edges of the patty. Cook until the internal temperature of the hamburgers measures 160 degrees F.
For cheeseburgers, top burgers with one slice of cheese each in the last 1-2 minutes of cooking. Remove hamburgers (or cheeseburgers) from the grill. For toasted hamburger buns, turn off grill heat. Place the buns, cut side down, directly on grill grates for 1-3 minutes, until they reach the desired level of toastiness. « What’s the Difference in Liquid Egg Products?